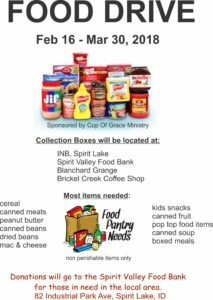 Cup of Grace Ministries is sponsoring a Food Drive to support Spirit Valley Food Bank, one of our area’s non-profit local food pantries. Spirit Valley Food Bank is located at 82 Industrial Park Avenue, north of the town of Spirit Lake, and is open every Thursday from 10:00am-3:00pm. They serve families from Old Town, Newport, Blanchard, Spirit Lake, Athol and surrounding areas. The food bank has three or four regular volunteers. Some of them visit WinCo every Monday and collect bread donations, as well as any produce that the store is ready to take off of the shelves. Other volunteers collect donations from Second Harvest, including “salvage” produce. Diane says she combs through the produce and makes it look presentable before putting it on the food bank shelves. While these donations are a blessing, the food bank also needs many non-perishable foods, such as cereal, peanut butter, canned and dried beans, canned soup and boxed meals. This is where Cup of Grace comes in. We have organized a food drive to collect non-perishable foods for the Spirit Valley Food Bank. The Food Drive will run from Friday, February 16th to Friday, March 30th. 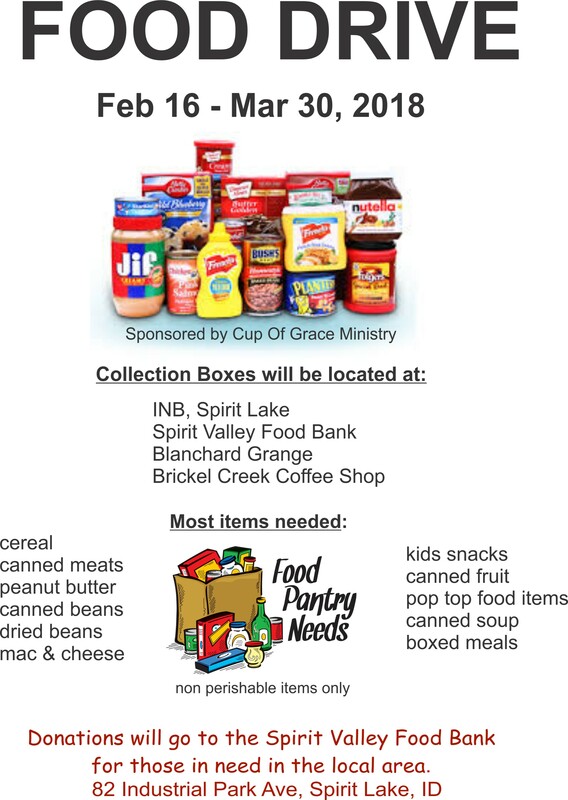 Please consider picking up a few of these needed items next time you go to the grocery store and deliver them to one of the collection boxes (see poster for list of items and collection box locations). As James says in James 2:15-16, “If a brother or sister is without clothing and in need of daily food, and one of you says to them, “Go in peace, be warmed and be filled,” and yet you do not give them what is necessary for their body, what use is that?” Let’s put our motto to work: “Neighbors helping Neighbors”!